Christian hope is one of the greatest blessings because it increases our joy, assures us of our blessed future, gives us patience to bear burdens, and it helps us keep our eyes above, where Christ is. But how can we strengthen our Christian hope? William Gurnall gave six directions for strengthening hope. I’ll summarize them below; notice how intimately the growth of Christian hope is tied to the Word and prayer. Study the word of God diligently. The Christian is bred by the word, and he must be fed by it also. “…Through perseverance and the encouragement of the Scriptures we might have hope” (Rom. 15:4 NASB). God has provided in Scripture food to nourish every Christian grace, and in it we find particular respect to the welfare and growth of our hope. Keep your conscience pure. Sins that are deliberately plotted and committed are to the Christian’s hope as poison is to his body. Faith and good conscience are hope’s two wings that help her fly. If you have wounded your conscience by any sin, renew your repentance so that receiving renewed forgiveness you may revive your hope. Pray to God daily and beg for a stronger hope in him. This is what Paul prays about in Romans 15:3, “May the God of hope fill you with all joy and peace in believing, so that you will abound in hope by the power of the Holy Spirit” (NASB). Be sure you humbly acknowledge God by a constant waiting on him for growth. God will surely hear the prayers of his children when they beg for more hope. Labor to increase your love for the Lord. There is a secret but powerful influence that love has on hope. Love casts out fear (1 John 4.18). “May the Lord direct your hearts into God’s love” and into the patient waiting for Christ’s return (2 Thes. 3:5). Love him, and you will patiently wait for him – this has to do with hope. Exercise your hope much. Repeated acts strengthen habits. The promises of God are hope’s object to act upon. Meditate on the promises, set some apart for yourself, and drink in the refreshing truths of God’s promises. David did this when he remembered that with the Lord there is forgiveness (Ps. 130). He exercised his hope by meditating on the promise of forgiveness. Fill up your experiences of past mercies, and your hope will grow stronger for future mercies. Endurance works hope (Rom. 5:2-4). A good Christian keeps track of the history of God’s gracious dealings in the past, and this gives him hope for the future. “This I recall to mind, therefore I have hope” (Lam. 3:21 NASB). When God gives one mercy, he opens a door so he can give it, and this open door leads us to expect more mercy through it. William Gurnall, The Christian in Complete Armor, volume 2, pages 177ff. Quite often waiting is very difficult. In our instant culture, most of the time we don’t even like waiting one week for a package to come in the mail; we get impatient if our internet is a tiny bit slower than usual or if our data connection isn’t lightning fast. Waiting can be frustrating! Truly, any time is too soon for him to receive a mercy from God that thinks God’s time in sending it is too late. Gurnall goes on to say that impatience in waiting for God’s promises to come true arises from our selfishness since we prefer our own contentment and satisfaction before God’s glory. Impatience also arises from ingratitude and forgetfulness (Ps. 106.13). God wasn’t obligated to make any good promises to sinners like us. But in his sovereign and free mercy, he did promise salvation and all the blessings that go with it. Therefore, it’s fitting and right to be patient and to say that his timing is best. And we put on “the hope of salvation as a helmet,” knowing he will keep his promise (1 Thes. 5:8)! “And this is what he promised us – eternal life” (1 John 2:25 NIV). The above-edited quote by William Gurnall is found in volume 2 of The Christian in Complete Armor, p. 151-2. I’m nearly finished reading an excellent book that honestly walks through the suffering of cancer while resting in the hope of God. 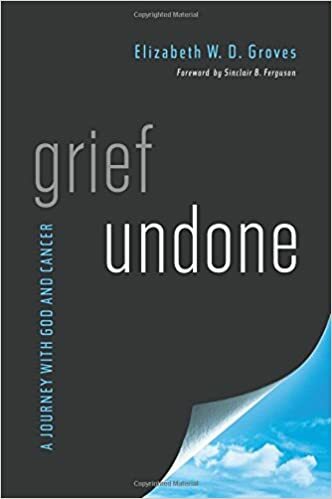 It’s called Grief Undone and it was written by Elizabeth Groves whose husband, Alan, died from cancer in 2007. As some of our readers may know, Alan Groves served in various departments at Westminster Theological Seminary. 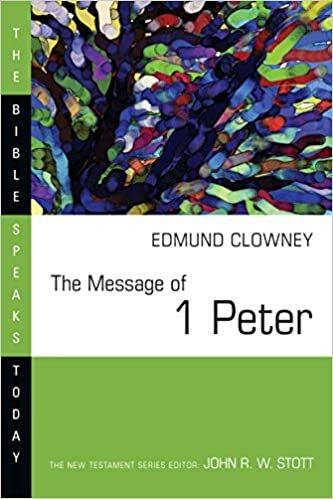 This book is something like an autobiography (Elizabeth’s) and a biography (Alan’s) together in one, but ultimately it is a testimony of God, our only rock and refuge in time of storm. “Daily and hourly we set our hope in the certainty of our Father’s love in the midst of uncertainty about what would happen to Al. I don’t know that that was a measured, intellectual decision on our part as much as it was just the natural cry of desperate children who know their Father is the only one who has answers and help” (p. 18). “It is not being healed from cancer in this life in which I ultimately hope. Rather, it is in Christ now and forever that I find my hope. I have been healed and raised in that ultimate sense by all that Christ has done. Blessed be his name” (p. 43). You can’t read this book without being moved. Having lost friends and family to cancer, I had to put the book down a few times because it squeezed tears from my eyes as I remembered the suffering of it all. But in the midst of suffering there is hope that shines brightly through. It’s not a false, flimsy, or “better place” type hope. It’s the hope that Elizabeth leaned upon, that Alan rested in, and that all Christians can take comfort in. It’s a “living hope” that we have through the resurrection of Jesus, a hope that we can hold fast to because “he who promised is faithful.” It’s the hope of eternal life in Christ; the hope of a renewed, resurrected, and imperishable body; the hope of being with the Lord forever in the new creation where there will be no more tears. This book testifies of that hope! Elizabeth Groves, Grief Undone (Greensboro: New Growth Press, 2015). 1. Faith comes by hearing (Rom 10:17), hope by experience (Rom 5:3, 4). 2. Faith comes by hearing the Word of God, hope comes by the credit that faith hath given to it (Rom 4:18). 3. Faith believes the truth of the Word, hope waits for the fulfilling of it. 4. Faith lays hold of that end of the promise that is next to us, that is, in the Bible; hope lays hold of that end of the promise that is fastened to the mercy-seat. The promise is like a mighty cable that is fastened by one end to a ship, and by the other to the anchor. The soul is the ship where faith is, and to which the other end of this cable is fastened; but hope is the anchor that is at the other end of this cable, and which enters into that within the veil. Thus faith and hope lay hold of both ends of the promise and they carry it safely all away. 5. Faith looks to Christ, as dead, buried, risen, and ascended; and hope to his return (1 Cor 15:1–4). Faith looks to him for justification, hope looks to him for glory (Rom 4:1–8). 6. Faith fights for doctrine, hope for a reward (Acts 26:6, 7). Faith fights for what is in the Bible, hope fights for what is in heaven (Col 1:3–5). 7. Faith purifies the heart from bad principles (1 John 5:4, 5). Hope purifies the heart from bad conduct (2 Peter 3:11, 14; Eph 5:8; 1 John 3:3). 9. Faith looks through the Word to God in Christ; hope looks through faith beyond the world to glory (Gal 5:5). John Bunyan, Israel’s Hope Encouraged, from volume 1 of Works. This is such a good book: How Long O Lord by D. A. Carson. I wish I had read it years ago! As I read through it now it is helping me in the faith in quite a few different ways. It’s one of those books I’m marking up like crazy and will for sure use often in future studies and personal devotions. “This sort of god [who is not omnipotent] cannot offer us any comfort. Belief in an omnipotent God brings with it all sorts of hard questions about how such a God, if he is good, can permit evil and suffering, but it also brings with it the promise of help, relief, an answer; an eschatological prospect. To abandon belief in the omnipotence of God may ‘solve’ the problem of evil, but the cost is enormous: the resulting god is incapable of helping us. He may be able to give us quite a bit of sympathy, and even groan along with us; but he clearly cannot help us – not now, and not in the future. There is no point praying to such a god and asking for his help. He is already doing the best he can, poor chap, but he has reached the end of his resources. For all that one sympathizes with [Rabbi] Kushner’s search for a God he can respect, he has ended up with a god who cannot help” (p. 30). The above quote was taken from How Long, O Lord? by D. A. Carson (2nd ed. ).